My company gives me five paid days off each year to volunteer. I decided to use this time to help walk and socialize dogs at the local animal shelter. This is Howie, a rambunctious and fun little Pit Bull mix. This is Peanut, supposedly a Rhodesian Ridgeback mix. I have to confess, though – I have an ulterior motive. I want to adopt one of the puppies here at the shelter and give it a good home. Walking and socializing them is a great opportunity to get to know them a little better first and find the right one. Maybe someone like this guy? Time for a couple more critter photos. 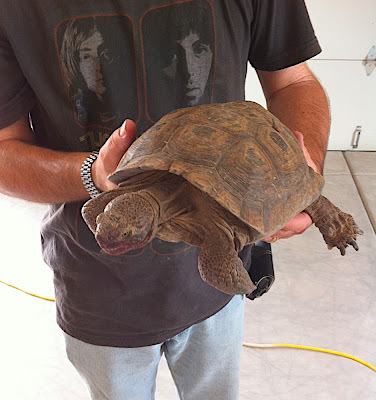 We found this desert turtle in the middle of the road near a friend’s house. It was pretty lively, full of energy, scootin’ around all over the place. The discolored face is probably from eating cactus fruit. On weekend mornings we’re in our backyard working out. Apparently a family of javelinas have a established path they travel across our property about a hundred feet behind our house. Sometimes we see them moseying down the hill like in this photo. Click here for more and larger critter pictures.